George Randolph was a performance always looking for an audience. With passions for students, live theatre, and all things Disney, his larger-than-life personality shined through in all that he would do. The retired Polk State Theatre professor and director died Dec. 13 at the age of 72, leaving behind a legacy of laughter and dedication to his students. Randolph was born in West Palm Beach on May 28, 1945. 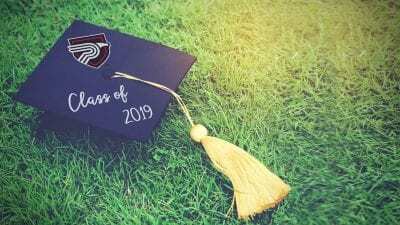 He received an Associate in Arts degree from Palm Beach Junior College and bachelor’s and master’s degrees from the University of South Florida. He was an only child who married once and never had children. He didn’t have close relatives, but his life was rich with relationships he developed at Polk State College. Randolph started his career at Polk State in 1975, teaching Theatre, Film History, Humanities, and Speech until he retired in 2009 after 34 years of service. He also spent time teaching at USF and Bartow High School. “His students were his family,” said Shannah Butcher, Randolph’s professional guardian. 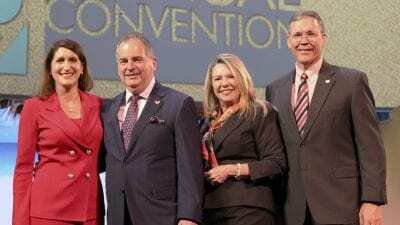 Marc Durso, Polk State’s May 2010 Distinguished Alumnus and owner of South Florida acting school ActTrue, recalls Randolph as a professor with boundless energy, inexhaustible ideas, and the highest creative standards. He showed up to audition for the sketch comedy program and has been working in the entertainment industry ever since. He was also an all-around art intellect and theatre buff. During Randolph’s tenure, the College put on many productions — from classics including Shakespeare and Greek dramas, to modern shows and comedies. “George loved comedy,” Sharp said. 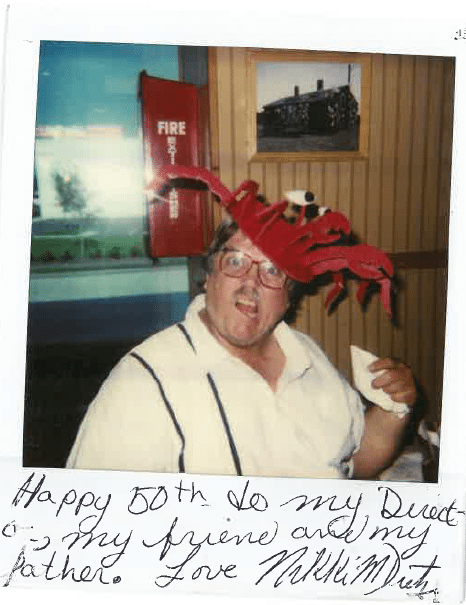 Barbara Lloyd, a senior accountant with the College, noted Randolph’s great sense of humor and ability to make everyone laugh. “He was a performance looking for an audience,” Lloyd said. And Randolph had an equal love for Disney. In 1972, a student gifted him a Mickey Mouse candle, sparking a collection of Disney memorabilia that grew and grew with the help of more students. 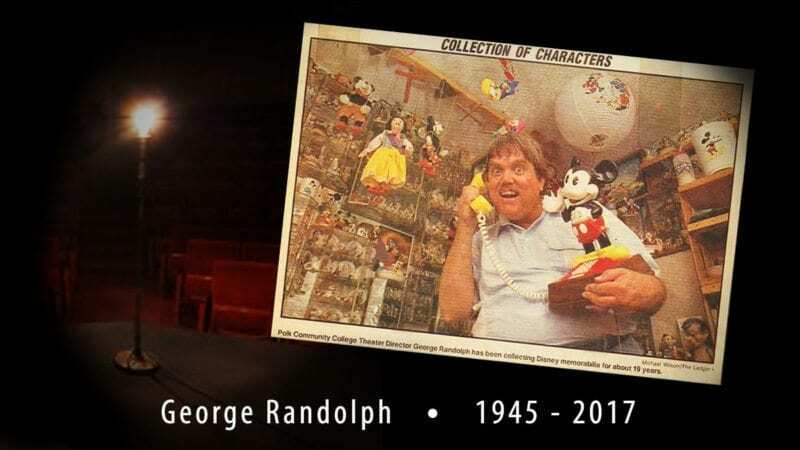 “Ever since I can remember teaching theatre at Polk Community College, the casts will give me a gift relating to Disney at the cast party after the last night of the theater performance,” Randolph told The Ledger in 1991. 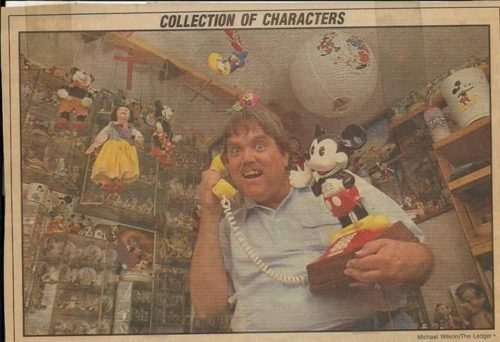 He was featured in the newspaper for his extensive collection, pictured holding a Mickey Mouse phone to his ears in front of shelves filled with Disney figurines, snow globes, mugs, and puppets. A small memorial service in honor of Randolph is scheduled for 11 a.m. Thursday, Dec. 21, at the Central Florida Casket Store and Funeral Chapel, 2090 E. Edgewood Drive, Lakeland. Polk State is planning a memorial service for early next year in conjunction with the continued celebration of the College’s 50 years of theatre. 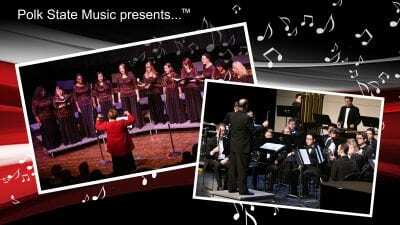 More information will be available soon.